Bradley Schad (left) of the Missouri Corn Growers Association and Steve Murphy of POET Biorefining on a tour of the Laddonia ethanol plant. If you drive a gas-powered vehicle, then chances are you’re buying a lot of something you know little about – ethanol. Unleaded gasoline in Missouri, with a few exceptions, is an E10 blend. That means it’s 10 percent ethanol and 90 percent unleaded gasoline. 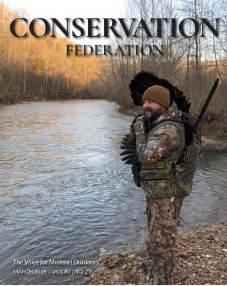 In Conservation Federation Podcast Ep. 019, Bradley Schad of the Missouri Corn Growers Association and Steve Murphy of POET Biorefining sit down with Brandon Butler to explain ethanol. “The Conservation Federation of Missouri (CFM) has been partnering with the Missouri Corn Merchandising Council for over four years now. Row crop farmers across Missouri care about the lands they own and work, and we appreciate all they do to support wildlife on those lands,” said Brandon Butler, CFM Executive Director. The Missouri Corn Growers Association (MCGA), established in 1978, is a grassroots organization of farmer-members dedicated to increasing the profitability of corn production by developing and expanding the following: corn markets, collecting and distributing information, building coalitions with organizations and industries and participating in the governmental process. POET Biorefining is one of the world’s largest producers of ethanol and other biorefined products. Their mission is to be good stewards of the Earth by converting renewable resources to energy and other valuable goods as effectively as humanly possible. POET has two Missouri plants – Laddonia and Macon. They employee nearly 100 people. Both the Missouri Corn Merchandising Council and POET Biorefining are Business Alliance Members of CFM. To learn more about Missouri Corn Growers Association, visit http://www.mocorn.org/. To learn more about POET Biorefining, visit https://poet.com/.